A bit soggy from rain, Craig delivers a talk to the Asian Development Bank. It was June 5. World Environment Day. 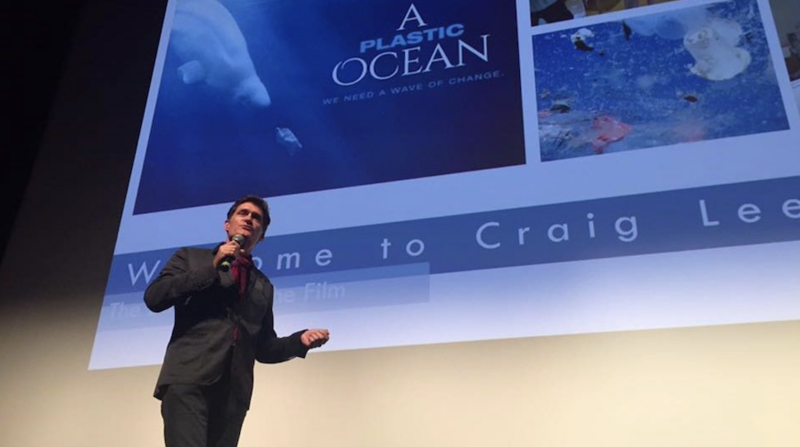 I had flown to Manila, the capital of the Philippines, to speak about the issue of plastics in the environment and to screen the film I had directed on the topic, called A Plastic Ocean. The downpour was a reminder who was boss. Mother Nature was in charge. I arrived at the cinema looking like I had swum from Hong Kong for the event. The air conditioning was freezing. My shoes squelched with water. But it was, afterall, just water. I’d been in far worse shape in more significantly unfriendly environments. I wasn’t going to disappoint those waiting because of a rainstorm. The first week of June was a significant week on the environmental front. Welcoming World Environment Day and World Oceans Day was a storm of announcements on banning or limiting single use plastic products. From California to Colombia and every place in between, it was as if banning single-use plastics had suddenly become trendy. But this was the culmination of a great deal of hard work by many people and organisations, including my colleagues at the Plastic Oceans Foundation. European Union proposes EU-wide rules targeting the ten single-use plastics most often found on beaches, as well as addressing lost and abandoned fishing gear. UK announces ban on cotton buds, straws, plastic stirrers. Woolworths supermarket announces it is banning plastic bags from its supermarkets. Coles Supermarkets announces it will ban plastic bags. When we first began the A Plastic Ocean film project ten years ago the team then did not anticipate the powerful effect the film would have globally and so quickly after its release in January 2017. Since the release, it has been screened in cinemas in more than 70 countries and streamed on iTunes, Amazon and Netflix. It is available in more than 15 different languages. The Plastic Oceans Foundation also created a 22-minute short of the feature-length film for different types of schools curriculum, which has now been adopted around the world. 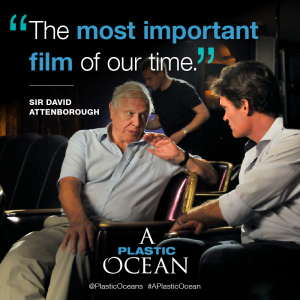 The appearance of Sir David Attenborough in A Plastic Ocean also opened the floodgates of awareness as it was the first time he’d publicly backed an issue or an issues-based film. He called our film “The Most Important Film Of Our Time” and then went on to include the issue in Blue Planet II, which was released on the BBC 10 months after A Plastic Ocean and which helped spread the awareness even further, resulting in campaigns by the BBC and National Geographic magazine. Other channels, such as Sky, and newspapers such as the Telegraph, Sunday Mail, the Independent, The Guardian and Times and Newsweek, have also taken up the cause and regularly call on experts at the Plastic Oceans Foundation for comment as the issue is taken up by governments, corporations, and individuals globally. In discussion with Carlos Vives, mapping out the fight to save our oceans. independent screenings any night of the week anywhere in the world. It has also led the education campaign, designing curriculum that helps students follow up and study the issue of single-use plastic, leveraging the science provided in the film. The US has also fostered strong relationships with governments, organisations and corporate entities around the globe to help bring the issue to every work space, office and cultural centre possible, from Apple to the Attorney Generals office in Colombia. The team also fostered new relationships with influential people such as South American musical sensation Carlos Vives through his charity Tras La Perla de Americana. I was honoured to be invited by Carlos to speak with him in Bogota earlier this year at the Attorney General’s Earth Summit and to later visit his indigenous friends the Arhuaco in the Sierra Nevada mountains. We recently celebrated the one-year anniversary of the Plastic Ocean’s Chile Foundation. Headed by Mark Minneboo, Chile’s greatest achievement to date was creating awareness which helped change government policy on single-use plastics, resulting in the new president announcing a national ban on plastic bags. This came about following a coastal bag ban by the previous environment minister, Marcelo Mena, who told me during a visit to Chile earlier this year that he and his wife were influenced by watching A Plastic Ocean. Chile has presented the film in 36 different events, with a reach of more than 10,000 people. 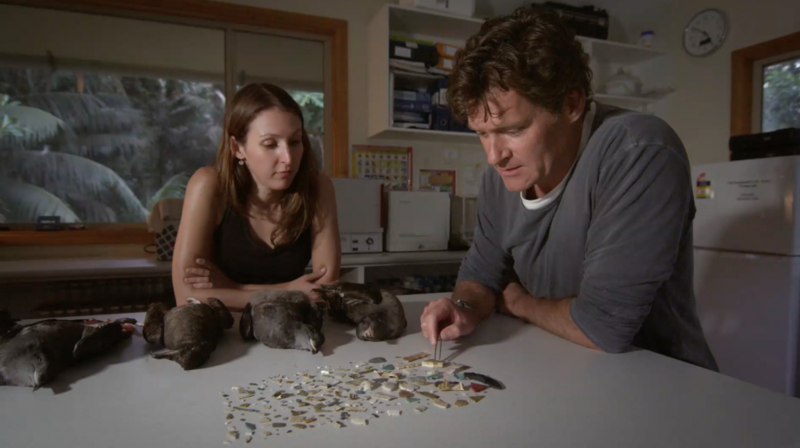 Their work has attracted local media attention, with POFC’s resident scientist, Camila Ahrendt soon to be featured in an international magazine on explorer scientists. Chile also represented Plastic Oceans at the International Impac4 marine protected areas conference in La Serena, after initially being rejected. After presenting the film to the Ministry, our team in Chile shared the stage with photographer Chris Jordan who produced a documentary on the plight of Leysan Albatross on Midway Island. Plastic Oceans Chile also presented the film twice at the Social Innovation festival fIIS, the biggest of it’s kind in South America, with editions planned also in Los Angeles and Amsterdam. Chile’s education work includes four Universities, where they are helping the administration end the use of single-use plastics on campus. Chile’s network includes more than 60 partners, NGOs, banks, schools, Universities and municipalities. World Oceans Day beach cleanup in Mexico. We also started the foundation’s work in Mexico, through executive director, Mariana Soto, who hosted a screening at the Universidad Iberoamericana in November to more than 200 people. 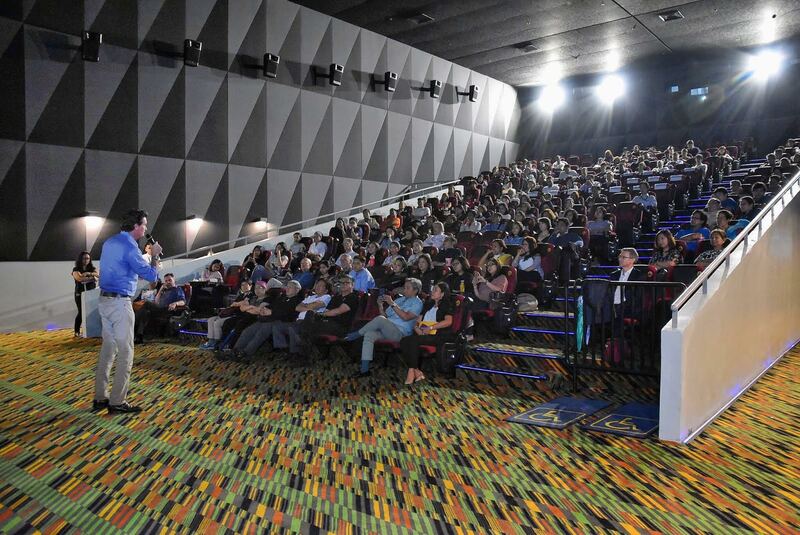 The screening was followed by a panel discussion with Mexico’s Ministry for the Environment. In February Mexico was invited to the World Ocean Summit and began to build strategic alliances with local NGOs and the Mexican Government. Through the branding of the new Foundation and the awareness it had raised in Mexico in such a short time I was invited by TedXPitic to give a talk which resulted in the entire event being declared zero plastic waste. As a result the government of Sonora legislated to ban plastic bags. This led to a domino effect. In April, plastic bags were banned in Queretaro. 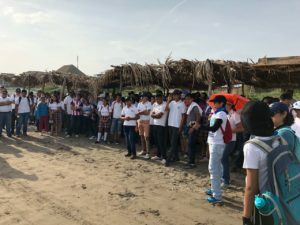 In May, Plastic Oceans Mexico partnered with a recycling organization to collect marine plastic debris and recycle it into iconic products to help encourage the local communities to #rethink plastic. They are now working to produce the first prototype plastic brick-building machine. In June, we partnered with Buena Pesca, Ecolana and Renovare to establish the first circular economy using marine plastic, beginning in the small county of Veracruz, Alvarado. The model the team is building will be replicated around Mexico if it proves successful. Canada has also recently reestablished itself, gaining charitable status and building momentum through schools and public screenings of the film, thanks to work and patience of Ian Merkel and John McCulloch. As it establishes itself, it is drawing on the US to help it begin developing and leveraging partnerships. In Hong Kong, board members and restaurateurs Malcolm Wood and Matt Reid have redefined the very nature of the food and beverage industry, leading the ban on single-use plastics, including straws, cups and takeaway packaging and conducting seminars, screenings and panel discussions that have influenced almost every restaurant group in the city. CEO, Daniel Auerbach, led a delegation from the Foundation to a special screening and panel discussion on the issue at the Harvard Faculty of Public Health, where the science behind the film was endorsed by the Dean of the faculty. HKPOF has also been busy developing partnerships with businesses like Asia Marine, who is donating a percentage of its charters to the charity. Also just announced is a new partnership with Feather And Bone where customers can donate their loyalty points to Plastic Oceans to help the Foundation continue its work. The United Kingdom, the original home of the Foundation, has developed its own schools curriculum utilizing the 22-minute version of the film. It has also been busy promoting the science behind the feature film at panel discussions, screenings and events. The first six months of this year have taken the film and the foundation to new territory and created incredible awareness across the planet. I’m proud to have been a part of this process and to have witnessed and influenced the start of this #awaveofchange. Join us. Go to www.plasticoceans.org. Donate, reach out for a screening, or simply become aware and change your plastic consumption habits. This is just the beginning. As I speak with more children in schools around the world, I realize how knowledgable and determined they are to undo the damage of the past 70 years. In their hands lays the future of the planet. With knowing comes caring and with caring comes change.